Couples braved long queues and bad weather for their chance to say "I do". Thousands of couples queued at registry offices across China on Friday, in the hope that marrying on the date would bring them lasting romance. The rush came because the Mandarin for 4 January 2013 sounds similar to the phrase "I will love you all my life". 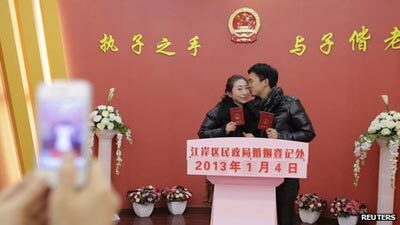 At least 10,000 couples were due to tie the knot in Beijing, with many more turning up without an appointment. A similar wedding rush took place on 12 December, the century’s final repeating date. Matching days, months and years – like 12/12/12 – are being considered to bring good fortune, but that particular date also sounded like "will love" in Mandarin, China’s state news agency Xinhua reported in December. Extra government staff had to be deployed then to cope with the increased number of people. On Friday – nicknamed "love you forever day" – couples were once again crowding into civil affairs departments in provinces around the country. Couples in the southern island province of Hainan even braced bad weather and lined up in the rain, waiting for their chance to say "I do". Weddings are a multi-billion-dollar business in China, with more than 10 million taking place every year. Numbers play an important role in China, with eight – which sounds like the word "prosperity" – being considered particularly auspicious, the BBC’s Viv Marsh says. The Beijing Olympics, for instance, started on the eighth day of the eighth month in 2008. As a result, there was a huge rush on marriages on that day. Telephone numbers and car registrations containing the number eight can command astronomical fees. Four, on the other, is traditionally perceived as unlucky because its pronunciation echoes the Mandarin word for "death". Some high-rise buildings in China do not have a fourth or 14th floor for that very reason.